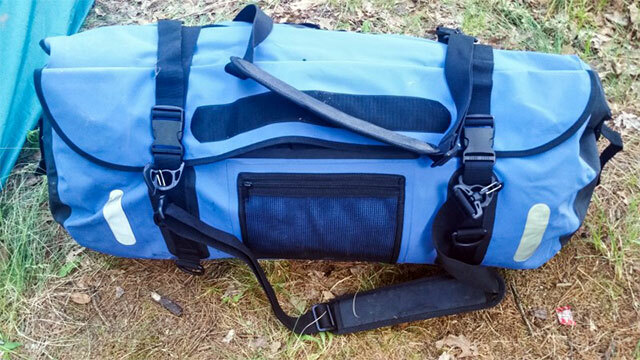 The Liberty Ship duffle bag by Dry Case is made with a high quality marine grade waterproof vinyl and has 80 liters (or a little over 21 gallons) of waterproof storage. It also has a Velcro closure with a large integrated pocket to store smaller items. The pocket compartment is not waterproof, but is water repellant. The front mesh pocket permits you to store items that don’t matter if they get wet or if they have already gotten wet. The bag includes webbing for the use of carabineers and removable shoulder straps. It’s accented with reflective strips for safety and visibility in case it goes overboard. There is also an air valve for inflation or compression and a handy D ring for hanging items you may need to access quickly. On a recent overnight river trip, the Liberty Ship dry bag easily held my queen-size pillow and cotton sleeping bag with room to spare. Nothing was even damp from our two-day trip and the bag compressed so nice for storage. The adjustable padded shoulder straps allow for a comfortable backpack-style carry or you can use the handle for side carry. The marine grade vinyl is tough. It resisted punctures and tears when being thrown into an aluminum canoe during the trip. Sand didn’t get into my stuff after throwing the bag on a sandy shore either. Prior to our trip, I tried a submersion test and absolutely no water made its way into the bag. Overall, I have reviewed two products from Dry Case, one being the Liberty Bag (obviously) and the other a waterproof speaker. Both products are living up to their promise of quality and being totally waterproof. For more information, please visit www.DryCase.com.